Patrick Woulfe’s work on Irish names has fascinated and informed generations since first published in the early twentieth century, helping to popularise the use of Irish first-names during the last century. Woulfe has been an important resource for genealogists, especially his magnum opus, of the same name – Sloinnte Gaeḋeal is Gall – published in 1923 and reprinted a number of times since then. This smaller book was originally published in 1906 and reprinted in 1922 as a new edition, which is reproduced here in facsimile. Woulfe stated in his preface to that work that his aim was ‘simply to supply the Irish forms of our names and surnames, and to furnish a few rules which will help to secure them a correct grammatical setting.’ While subsequently superseded by scholars, such as Edward MacLysaght, Woulfe’s legacy remains important and enduring in the study and etymology of the Irish naming system and old surnames and first names. This highly informative little book will appeal to family historians and those interested in the Irish language. 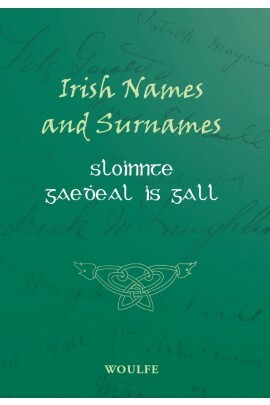 NOTE: Buyers should be aware that this is not the large publication of the same name, Sloinnte Gaeḋeal is Gall – published in 1923 and reprinted by the Genealogical Publishing Company, Baltimore 1967 (and subsequently reproduced on other occasions). The larger work, for which Woulfe is best known, runs to 696pp, with 46 pages of preliminary text, while this small publication extends to 168 pages.